In a room filled to capacity, with almost 2,000 budding culinary writers and publishers in attendance, Galway author Michael O’Meara sits on the edge of his seat and thinks. Nominated for world’s best seafood cookbook, and world’s best fish cookbook, Mr O’Meara found his book shortlisted in a pool of strong international talent with seafood experts from Japan, Ecuador, and the UK all vying for the same prize. This was Mr O’Meara last Sunday night week, when his cookbook, Sea Gastronomy: Fish and Shellfish of the North Atlantic, was a top contender for two awards at the Gourmand World Cookbook Awards in Yantai, China. Widely recognised as the ‘Oscars’ of the food industry, the award ceremony represents the most prestigious prize available to culinary writers worldwide. The cookbook reeled in both awards on the night, and was crowned one of the best in the world. More than 200 nationalities were present at the event which awards writers and publishers for “cooking with words” and their outstanding culinary exploits in particular fields, ranging from seafood and vegetarian dishes to street food and wine. 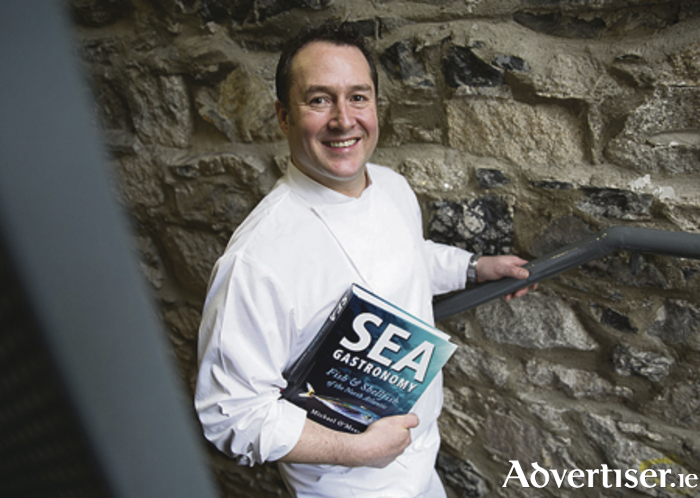 Michael O’Meara is the head chef of renowned Galway restaurant, Oscar’s Seafood Bistro, Dominick Street, and he has always had a passion for seafood but wanted to demonstrate it through more than just his love for cooking. A keen photographer of marine and sealife, Mr O’Meara wanted the cookbook to be an encyclopaedia of the sea. There are more than 380 colour images in the cookbook and he captured 99 per cent of the photographs used. For the first three weeks of the new year, he already has plans to travel abroad and his camera will be by his side for the entire journey. “It will be a little easier this time around because we have a format to follow, and it is going to be hard to change that,” admitted O’Meara, after receiving the most coveted award in the cookbook world on his first attempt. The water which surrounds Ireland is a national asset and supports a thriving marine economy with global market potential. Courtesy of the Pacific Ocean, the Irish west coast has the most nutritious waters on the planet, according to Mr O’Meara, along with one of the most biological diverse habitats for all sea creatures. The sector employs almost 17,000 people through seafood, tourism, renewable ocean energy, and oil and gas industries, and in 2010, the direct economic value of the Irish maritime industries was €1.2 billion. O’Meara wants to document the lives and habitats of these animals while they remain present in our seas, and is concerned about the lack of attention given to issues regarding sea and marine culture. International supertrawlers visit Irish coastlines on a regular basis for deep sea fishing, and these vessels are driven solely by profit with little care for the environment. “Few fish survive being trawled,” said Mr O’Meara, “meaning that there are enormous amounts of dead fish being dumped back into the sea because people don’t know what to do with them. The lack of protection was highlighted recently as the Spanish government brokered a deal which allows Spanish trawlers operating in Irish waters to catch 44 per cent more monkfish and 7 per cent more hake, which is an increase of 1,050 tonnes and 1,300 tonnes respectively. “If you own the land, you will protect it, and we own the sea so why not protect it too?” said Mr O’Meara. Published by Artisan House, Connemara, the cookbook is only the fourth book which it has produced. Directors Mary Ruddy and Vincent Murphy were delighted about the book’s victory and congratulated all its contributors, highlighting O’Meara’s dedication. “Michael is not only knowledgeable but passionate about fish and cooking. He is also a wonderful photographer and he brought all those skills to this book,” said Ms Ruddy. Mr O’Meara himself hopes the book can act as a catalyst for the protection of the waters which surround Ireland, and demonstrate that these waters are the most valuable, and sustainable, resources available to us.